Compulsive exercising when associated with an eating disorder, can lead to serious physical injury and even death. Generally compulsive exercising is associated with either anorexia or bulimia non-purging type (where the exercising is the compensatory behaviour rather than purging by means of vomiting or the use of laxatives or diuretics), and it brings with it a number of physical risks. Two common signs that exercise has become compulsive include that an individual will exercise at any cost and that an individual will only eat if they can exercise. Athletes in particular are susceptible to compulsive exercising as a behaviour associated with eating disorders. Compulsive exercising, or exercising beyond the point at which these activities cease to be healthy and instead can become harmful, brings a host of physical risks. Dehydration, stress fractures in bones, the development of osteoporosis or brittle bones, arthritis, the loss of the menstrual cycle and associated reproductive problems, and risk to the heart muscles are all dangers that can accompany compulsive exercise. There may be warning signs before any of these serious problems, such as feeling weak or dizzy during exercising, blacking out or losing consciousness during exercising, or experiencing inappropriate shortness of breath during exercising. Anyone who encounters these warning signs should cease exercising immediately and consult a medical professional. 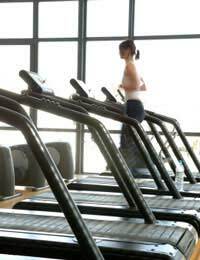 One indication that exercising has become compulsive is that an individual will exercise at any cost. This includes exercising instead of joining in social activities, exercising rather than attending social events, exercising strictly while on holiday, skipping work or school in order to exercise or even locking oneself away to exercise (such as in a bathroom or home gym). Exercising in bed, such as by furiously pumping ones legs or arms, is another indication that the activity has ceased to be healthy. In general, when exercising begins to interfere with an individual’s balanced lifestyle it is likely that exercising has become compulsive. Another indication that exercising has become compulsive is that an individual will only eat if they have, or can, exercise. When this is the case, exercise is clearly being used as a means of controlling calories to the extent that the individual fears gaining weight without it. In addition to burning calories, individuals with eating disorders may also use exercising as a means of reducing feels of guilt or shame about having eaten, or in order to allow themselves or give themselves permission to eat again in the future. Many athletes, including dancers, runners, swimmers, wrestlers, skaters and gymnasts, fall prey to the idea that they must always be slimmer in order to perform better, particularly before an important competition. In order to lose weight, such athletes may literally punish their bodies with exercise in the desire to win. Unfortunately, such activities can lead to injury just as often as they will result in better outcomes, and they can even lead to death. Compulsive exercising is a behaviour that is often linked to eating disorders such as anorexia and bulimia non-purging type. This activity brings with it a number of physical risks, and even serious athletes can fall victim to this dangerous behaviour. For further information on compulsive exercising and eating disorders, consult a medical or mental health professional or contact the Eating Disorders Association and/or National Centre for Eating Disorders.